Terra cotta flower pots are popular for gardening and craft projects. Shopping around can often help get a better price. 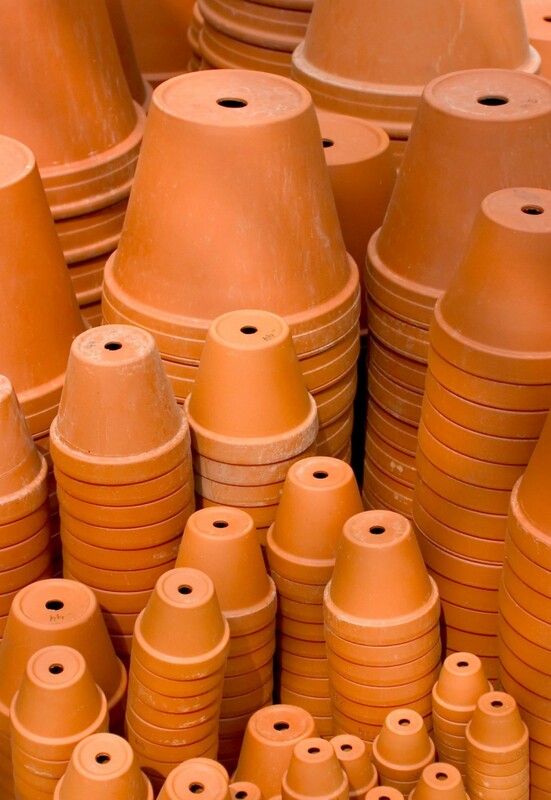 This is a guide about saving money on terra cotta pots. I am so frustrated. I am looking all over for a place that sells Terra Cotta (clay) pots to make clay people and cannot find them anywhere. These are not the usual size for regular pots for plants, but smaller sizes such as 1 3/4 inch, 1 1/2 inch, 1 1/4 inch, and 5/8 inch. If they sell these darn instruction booklets why do they not sell the pots or a link to find them. Any help would be much appreciated. Thank you. Dollar tree has them in tiny sizes 4 for $1.00 some have holes in the bottom some do not. If you need a hole in them soak the bottoms in water for 2-3 hours then using a massenary drill bit drill through the bottoms to make your own holes. I just bought some at Michael's craft store, I bought them on sale for 3 for a dollar. Ask them and they can order them for you as well! Also forgot to say Ben Franklin crafts has all those tiny sizes if you have one near you. Dollar stores, craft stores like hobby lobby, michaels, etc. Orientaltrading.com might be a good start also. SunshineCrafts.com is also a good place. Have you tried gardening centers? I found them there when my craft and dollar stores were all sold out. I am a fan of Sunshine Crafts, they seem to have everything and at a reasonable prices especially for bulk. I'm also frustrated by buying terra cotta pots in bulk. I've bought nearly all that I find and my business is growing and I need at least 100 of the 6 inch terra cotta pots with the saucers to match. They must be reasonably priced. Any suggestions on where I can find at least 100 or more? Thank you. I get my Terra Cotta Ppts at Hobby Lobby. Maybe they can order them for you. Sometimes WalMart has them. I don't know about tis time of year. Have you tried Marshall Pottery in Marshall, Texas? I have gone to many thrift/rag stores and they have them pretty cheap but dirty and also my friends store theirs not wanting to throw them away, but not wanting to use them either, and yard sales-even if you don't see them, ask, they usually didn't bring them because they thought they couldn't move them. I have over 100 6 inch terra cotta pots for sale. I worked at a gardening center. Let me know if you are interested and how much you think is a good/fair price for them. This pottery is made in Marshall Texas' at Marshall Pottery. The clay is there in that area that the pots are made with. There is an outlet, Pottery Tent on HY 59 in Marshall. There is a web site for the pottery. I found mine @ Meijers. I wanted to know how and where I can purchase different sizes of plain terra cotta pots in bulk? Thanks. I am in need of 3 to 4 - 18 inch, 4 to 5 - 12 inch, and about 5 or 6 - 9 inch terra cotta pots. Can anyone help? If you have a Hobby Lobby they used to carry those pots in all sizes. Most home improvement stores carry them. Where can I find large terra cotta saucers? I am looking for terra cotta pots 8" to 12" without a rim around the top. Any ideas? The rim is there for a construction/durability purpose. What is your need, plan? The thinner edge is more likely to chip without a rim, so manufacturers probably have no desire to make them. I am looking for wholesale terracotta pots; any ideas? I want shoping with yours. Archive: Where Can I Find Inexpensive Terra Cotta Pots? I'm looking for the most cost efficient terra cotta pots available. The size and shape don't matter. Any thoughts? Yes, I'm a dumpster diver and have retrieved some there, thoroughly sanitized them, and they are perfect. Where Can I Find Inexpensive Terra Cotta Pots? I agree with Dollar Store, but here in Houston, Texas, USA we have a store called Garden Ridge. They have everything you could ever think of from bedding, to planing, pictures, bath, silk flowers, and plants, wedding accessories, huge Christmas selection, baskets, statues, etc. I find terracotta pots at yard sales, thrift shops, and dumpster/curbside. Does anyone know where I can find inexpensive, small Terra Cotta pots? Have you tried Freecycle? Maybe someone has some to offer. Search for the Freecycle in your area. I have seen a lot for pennies at garage sales, so many uses for them. Try Home Depot or Wal Mart. We have a Dollar Store here where I got 4 small terra cotta pots for a dollar.